Have you been arrested or issued a citation after an encounter with a Police Officer? Are you uncertain as to what you should do next? Are you completely unfamiliar with how a criminal case proceeds? There are plenty of things you should do, but one thing you absolutely should NOT do is wait! You need to act fast. First, contact a criminal defense attorney in the area. 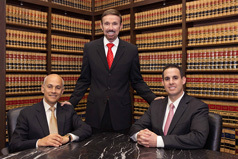 Getting an attorney in place to represent you as early as possible is crucial. By hiring an attorney early, not the day before your court date, the Attorney can make plans and be proactive in defending your case. If you are low on money and are not sure if you can afford an attorney, many will work with you on making payments towards the total fee. There are 3 types of cases in the world of criminal law: Infractions, Misdemeanors, and Felonies. An infraction is something akin to a speeding ticket, or for running through a stop sign. However, there are also many others including disturbing the peace, or driving without a license which may have more serious consequences come the court date. With an infraction, you are not facing the potential of jail time. There is no right to a trial by jury, instead the judge will decide everything after a court trial. Misdemeanors carry a possible jail sentence. The most amount of jail time you can receive for a misdemeanor arrest is 1 year in your local county jail. Many misdemeanors carry a maximum punishment of 6 months in jail and/or a monetary fine. Felonies are the most serious of all criminal offenses. If convicted of a felony, you could face possible time in a state prison facility, anywhere from 16 months to life in prison depending on the nature of the crime you are charged with, prior felony convictions, and enhancements based on your conduct. Whichever of the three you are charged with, it is a good idea to consult with an attorney, many will offer you a free phone consultation, or charge you a minimal fee to meet in person to discuss your case. Take advantage of this service! Once your attorney is in place, your court date will approach quickly. The first court date is called your arraignment. An arraignment is the hearing in which your attorney will enter a plea of guilty or not guilty on your behalf and pick up the police report and complaint that inform you of the charges against you. There are rare circumstances when pleading guilty at your arraignment is a good idea, and only a local attorney can help you in making the proper decision. Convictions on your record can carry a heavy price tag, do not plead guilty just because you do not want to be burdened! After the arraignment, the path your case takes, depends on whether you are charged with a misdemeanor or a felony. If you find yourself in any of these situations and need the assistance of an experienced California criminal defense law firm, call Wallin & Klarich today.